The number of nights that foreign guests stayed at hotels and other accommodations in Seoul averaged 5.66 in the first half of the year, with 55.3 percent of them visiting the South Korean capital for recreation, fun and holidays, a survey showed. According to the survey conducted by the Seoul Metropolitan Government and Seoul Tourism Foundation, 83.8 percent of 3,000 foreign respondents picked the Myeong-dong shopping area as the most popular destination in the city. 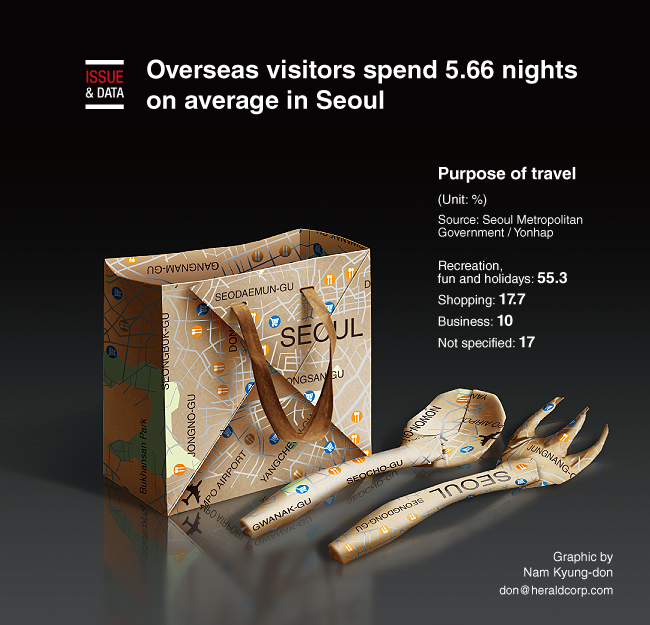 More than 92 percent of respondents said they enjoyed shopping the most, while the first thing about 79 percent wanted to do during their stay in Seoul was to taste the local cuisine.